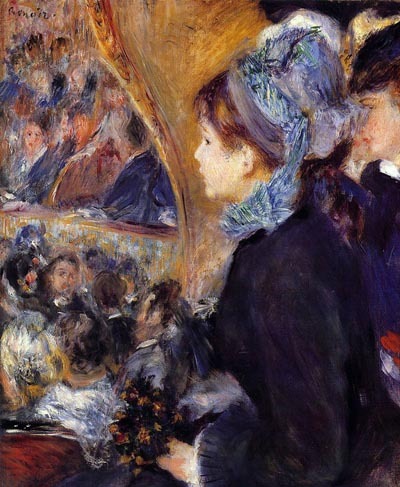 A. Renoir, "At the Theater", 1876- 1877. She was the first and sometimes the only woman whose music compositions were played in the most important theaters all over the world, who was produced abroad and decorated for her fine compositions even from the former and last Italian Royals, she was Giulia Recli. 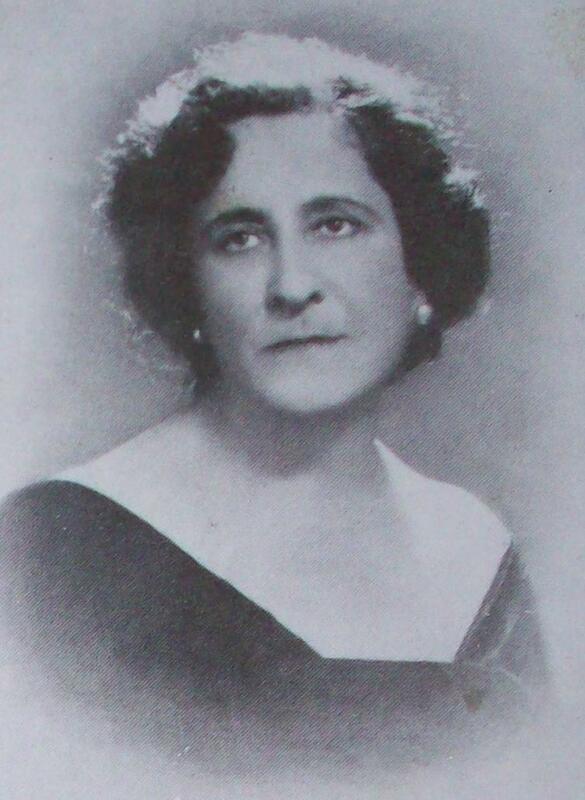 She was born on 4th December 1884 in Milan, her father was the “Commendatore” Luigi Recli, who was among the founders of the Ambrosiano Bank and her mother was the pianist Luisa Biancardi . Her musical studies was carry on by the most important teachers of her time as Alessandro Bonci , her vocal coach, or as Giovanni Maria Anfossi, her piano coach, and Ildebrando Pizzetti, her composition coach. Her first plays are from the 1910s and in 1914 the Scala of Milan commission her a composition which will become the symphonic poem entitled “Alba dell’anima” (The Sunrise of the Soul), in 1919 one of her tone poem, which lyrics were written by her sister Maria, poetess, was played at the Politeama Rossetti in Trieste . Her symphonic poem, played at the Augustus Theatre in Rome, and directed by the magnificent Master Tullio Serafin with the Santa Cecilia’s Orchestra, was defineted by the "Giornale d’Italia" (The Newspaper of Italy) “such as a baptism of the Feminism in music” because for the first time on the theatrical table there was the name of a female composer . In the 30’s she met and established with the Director of the Scala Choir, Vittore Veneziani , a long lasting collaboration which will be interrupted only with the world war but will restart at the end of that one. In the 50’s she was eletted Vice President of the Italian Musician Trade Union, in Italian SMI Sindacato dei Musicisti Italiani , and won few international awards as that one for women composers in Basilea and that one in Trieste with Campanelle (Little Bells) Song . In the USA she won the second and First award in the New York Musical Association with the composition for piano and singing called “Villereccia Song” . Her lyrics were too much appreciated in the USA and even produced by the Schirmer right from the 30’s but were also appreciated all over the world if they were played in the most important world’s theaters such as the Metropolitan Opera of New York, the Royal Albert Hall of London, the Scala in Milan, the Opera in Brema and also in the Opera in Budapest. From 1951 to 1966 she became Principal of the Lyceum of Milan and therefore she decided to organized classes, concerts, awards  to give talented young people the opportunity to learn and to be noticed. In 1965 the execution of one of her composition by the Orchestra of RAI (The Italian National Television) was celebrated even by the “Bible of the Music”: Billboard while in this same years, her last, she was honoured also by the Italian Republic for her artistic and philanthropic engagement as in the past years she was also decorated for her high merits for her compositions by the Italian Queen . Now the Italian Republic too glorified her work with two awards, the only female composer to receved the Ordine di Commendatore of the Italian Republic  in the 1964 and in 1969 just one year before she died, on 19th December 1970, in Brivio which has founded a local band called “Giulia Recli” in her honour. “Chi è? : Dizionario degli italiani di oggi”, FORMIGGINI A. F., Ed. Formiggini, 1928, pag. 403. “Le Lombarde in musica”, Fondazione Adkins Chiti: Donne in Musica, Colombo, 2008, pag. 136. Il Carroccio- The Italian Rewiev, vol. 18, pag. 70. “Le Lombarde in musica”, Op. cit., pag. 141. “Gal Writers are honored”, Billboard”, edizione del 4 dicembre 1965, pag. 22. “Women of notes: 1000 women composers born before 1900”, LAURENCE A., Ed. R. Rosen Press, 1978 , pag. 79. “Donne in Musica”, ADKINS CHITI P., Ed. Armando, 1996, pag. 177.